Home > Blog > Indigenous Land Rights: How Far Have We Come and How Far Do We Have to Go? Indigenous Land Rights: How Far Have We Come and How Far Do We Have to Go? Today is International Day of the World's Indigenous Peoples, observed every year on August 9, the anniversary of the first meeting of the UN Working Group on Indigenous Populations in 1994. It is a good time to reflect on the achievements and challenges Indigenous Peoples around the world still face. One pertinent issue is the legal security of land and natural resource rights. How well do national laws protect the interests of these historically marginalized communities? 1. Countries in Latin America and Africa have the strongest laws protecting indigenous land rights, while the Middle East lags behind. Of the 11 countries with the highest average scores across all 10 indicators, six are in Latin America (Bolivia, Colombia, Nicaragua, Panama, Peru and Venezuela), four are in Africa (Burkina Faso, Tanzania, South Sudan and Uganda) and one in Asia (Philippines). These developing countries scored higher than many in the developed world, including the United States, Canada, Australia and Norway, and are more progressive in protecting indigenous land and resource rights. All seven countries in the Middle East that were evaluated (Iraq, Israel, Jordan, Oman, Saudi Arabia, Syria, and Yemen) received the lowest possible score (4) across all 10 indicators, meaning that their national laws make no attempt to address indigenous land rights. In most cases the government has declared ownership of all land that is not private property, thus excluding communities from rights to communal land. This can be problematic for nomadic and semi-nomadic tribes of the Middle East that rely on seasonal migration to find grazing lands for their livestock. For example, in Jordan, state ownership of unsettled rangelands has led to encroachment and overgrazing because there are no longer incentives for tribes to protect and sustainably manage their lands. 2. Many national laws currently fail to ensure that indigenous land is protected from acquisition by governments and outsiders (land grabbing). Few countries have laws that require the Free, Prior and Informed Consent (FPIC) of Indigenous Peoples prior to acquisition by governments and outsiders. Of the 113 countries evaluated, only six countries (Colombia, Panama, Peru, Philippines, South Africa and Venezuela) scored a 1, meaning that the national laws require FPIC or other broad consent before acquisition. The global average across all countries scored is 3.2, meaning that the vast majority of countries make limited or no attempt in their laws to incorporate FPIC. But implementation of FPIC in these countries is still far from perfect. For example, in Peru, despite passing a groundbreaking Indigenous Peoples Consultation Law in 2011, the government has circumvented the law in many cases by narrowing their definition of Indigenous Peoples so as to exclude the vast majority of Peruvian communities who identify themselves as indigenous. 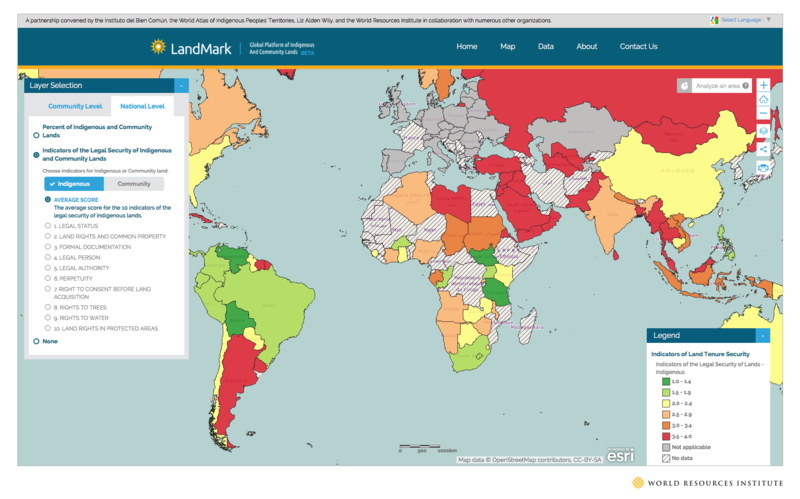 LandMark is currently in the process of developing a new set of national-level indicators due out next year that will evaluate the application and practice of the law, which will show which countries have upheld their laws in practice and which have not. The 113 countries evaluated in LandMark’s database show that the legal security of Indigenous Peoples’ lands and natural resources varies widely. Fortunately, several recent initiatives call attention to inequalities in the treatment of indigenous and community land rights in national law. One such initiative, launched in September 2015, is the UN’s Sustainable Development Goals (SDGs). Comprised of 17 goals and 169 targets that spell out a blueprint for development for the next 15 years, the SDGs capture several aspects of rights of Indigenous Peoples including health, education and cultural identity as well as land. Another initiative focused more exclusively on indigenous and community land right is the Global Call to Action, which seeks to double the amount of legally recognized land owned and controlled by Indigenous Peoples and communities by 2020. Thus the international community is looking to national governments to strengthen their laws and guarantee equal rights for Indigenous Peoples. We will be watching to see how they respond. To find out more about LandMark, visit the website – www.landmarkmap.org.